The other valve clearance: Here's An easy and quick method to ensure proper radial clearance between your pistons’ valve pockets and the edges of your valves. Here’s the situation: You’ve just completed your latest engine build, and spent untold hours—and max’ed out the budget--choosing just the right components for power production. Everything looks great and your excitement level is sky high, until you fire the engine. For some reason, the engine just doesn’t run quite right. Or maybe it fired right up but now doesn’t want to run at all. After ruling out all the easy stuff, you finally begin pulling components for a more complete inspection and discover one or more bent valves. 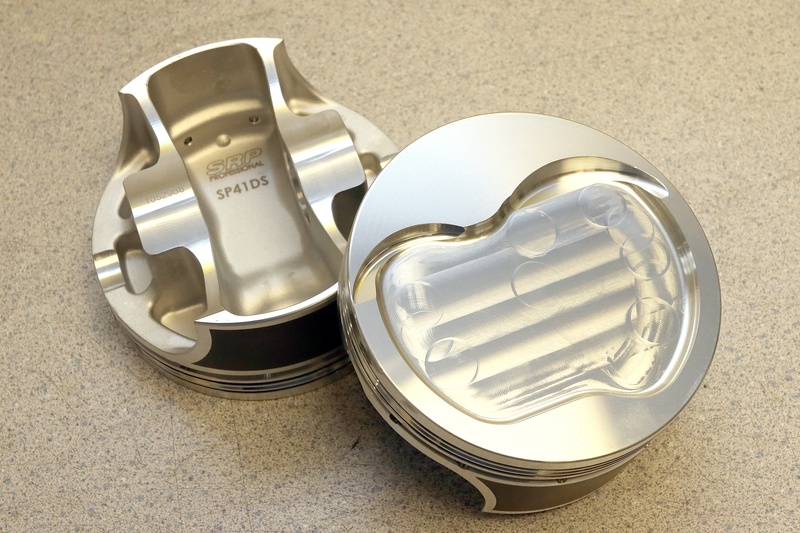 To keep their 625hp 427 Ford pump-gas friendly, Prestige Motorsports worked with JE pistons to come up with a custom SRP piston that has a 23cc dish. Anytime you are running a custom piston like this, taking a couple minutes to check radial valve clearance is an excellent idea. That’s the kind of thing that an engine builder’s nightmares are made of. Practically every engine builder will crash a valve into a piston sooner or later, and the damage can range from a single bent valve to a completely grenaded engine. So you definitely want to avoid pistons kissing valves whenever possible. Sometimes it will happen during a wide-open-throttle, high rpm blast when the springs can no longer maintain control and a valve lofts into a piston. Because of the valve angles, Fords don't have a valve pocket that's nearly as pronounced as the small block Chevrolet with its 23-degree valve angle. This is from an entirely different build, but we wanted you to see the bigger valve pockets on a SB Chevy. Other times a valve can get bent because there’s simply a miscalculation and the valves want to be in the same spot as the pistons at the same time. These can be avoided with just a few easy checks during assembly. Checking radial clearance is as simple as marking where the valve touches the piston and then verifying you have at least 0.050in between the lip of the valve and the wall of the pocket. To do this, begin by "painting" the edge of the valve with Dykem layout fluid. Most people are aware that you should check piston-to-valve clearance to make sure the valve doesn’t contact the piston on its travel up and down the cylinder bore. But there’s also a second check that should be done any time you are using a piston with valve pockets, also known as “eyebrows.” Valve pockets create a little extra room for valve movement while also keeping the engine’s compression up. Checking the piston-to-valve clearance will make sure the valve pocket is deep enough, but there should also be enough room between the edge of the valve and the wall of the pocket. This is called the “radial clearance.” Any time you are running larger than stock valves, custom pistons, or are mixing and matching components, radial clearance is a must check. Make sure you don't confuse Dykem's layout fluid with machinist's dye. 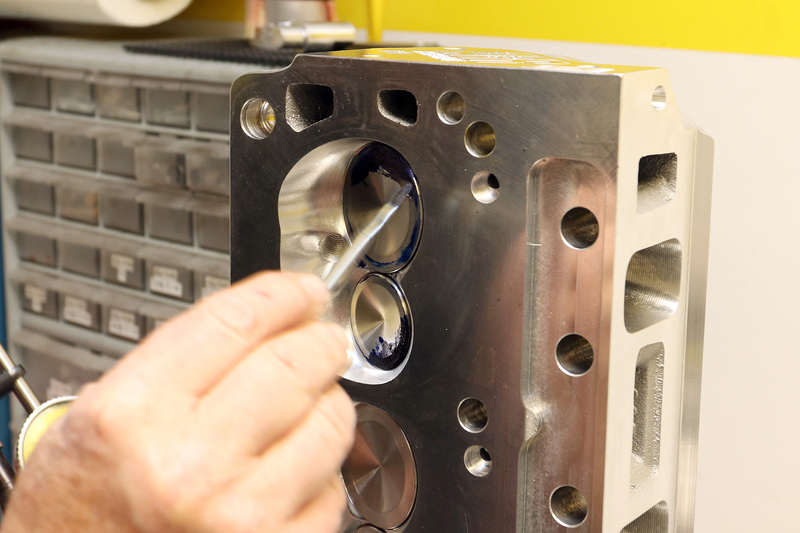 The layout fluid will stay wet so it will transfer to the piston where the valve touches it. 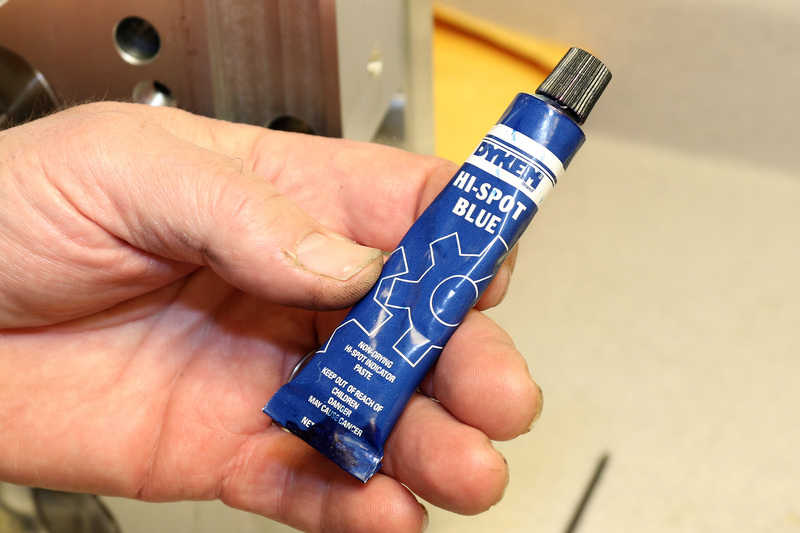 Machinist's dye is formulated to dye metal so that it's easier to see when you scribe a line. It dries quickly and will not easily transfer to the piston. Generally speaking, you want at least 0.050in clearance between the edge of the valve at the lip and the wall of the valve pocket. 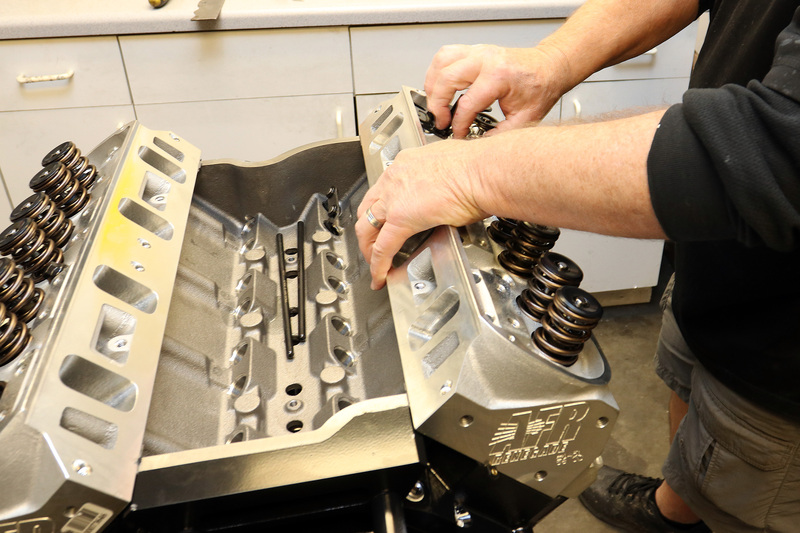 Building a race engine where a flat-top piston is required, aggressive engine builders may try to get away with less clearance and will have their valve pockets cut as small as possible to help improve compression. On the other hand, more clearance between the lip of the valve and the pocket wall won’t hurt anything and likely will only bring your compression down slightly. 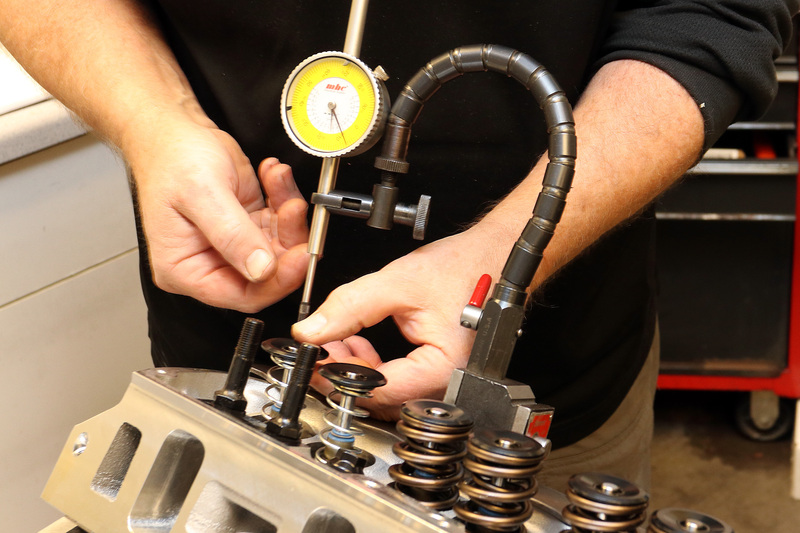 You will need to swap out the standard valve springs on one exhaust and one intake with lightweight checking springs. 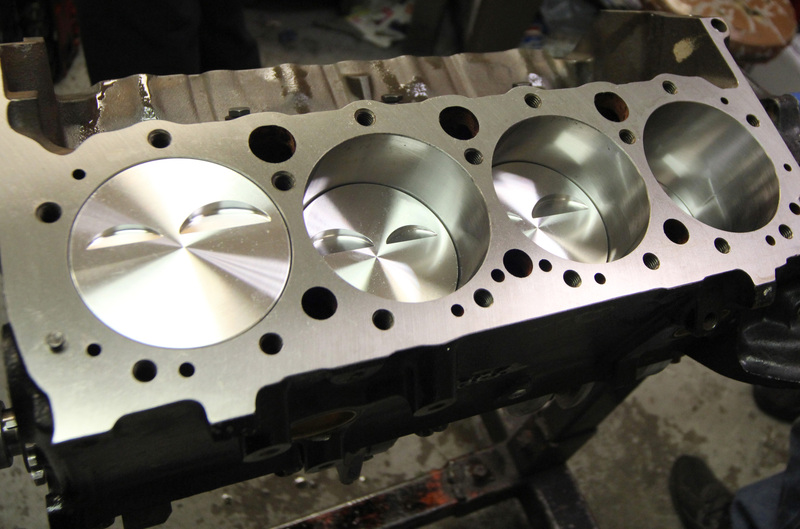 With the gaskets in place, set the head on the block and use a couple head bolts to secure it in place. You don't have to completely torque all the head bolts or compress the head gasket. Just make sure the head secured so it can't move or possibly fall off. For this story we stopped by Prestige Motorsports in Concord, NC. Prestige builds all types of engines, but this particular bad boy is a Ford Windsor stroker punched out to 427 cubic inches. It uses a World Products Man-O-War iron block fitted with a forged crank with 4.000 inches of stroke and 6.250-inch connecting rods. At the end of the rods are a set of forgings from JE’s SRP line that have been custom designed for this engine package. Use a dial indicator secured to the head to measure valve movement. Push the valve down, then slowly rotate the engine until the piston contacts the valve and pushes it up. The pistons fit a 4.125-inch bore, have a 1.245-inch compression distance to work with the stroker package, and a 23cc dish to help keep the big-inch engine happy on pump gas. There’s a Comp Cams solid roller camshaft with BAM tie-bar lifters, Scorpion rocker arms and a pair of AFR’s CNC-cut aluminum heads with 220 cc intake runners. The mad scientists at Prestige Motorsports say this package makes for a dependable motor with tons of torque and is very popular with classic Mustang owners looking to maximize fun behind the wheel. On the dyno it made 625 horsepower and 540 lb-ft of torque. For more information on Prestige Motorsports and the variety of engines they build, check out www.PrestigeMoto.com. Continue pushing the valve down and rotate the engine a few times to transfer the layout fluid from the valve to the piston. Repeat the process with the other valve on that cylinder. 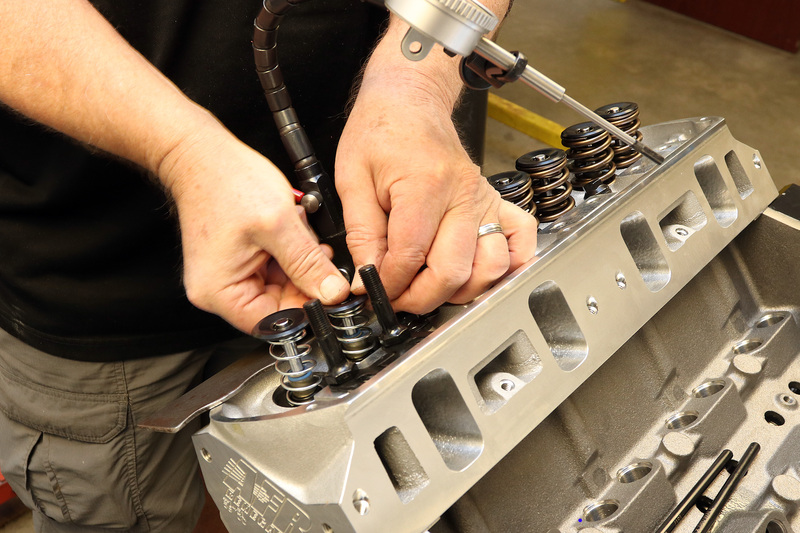 Now pull off the cylinder head and check the results, measuring the distance from the layout fluid transferred onto the piston to the edge of the valve relief. 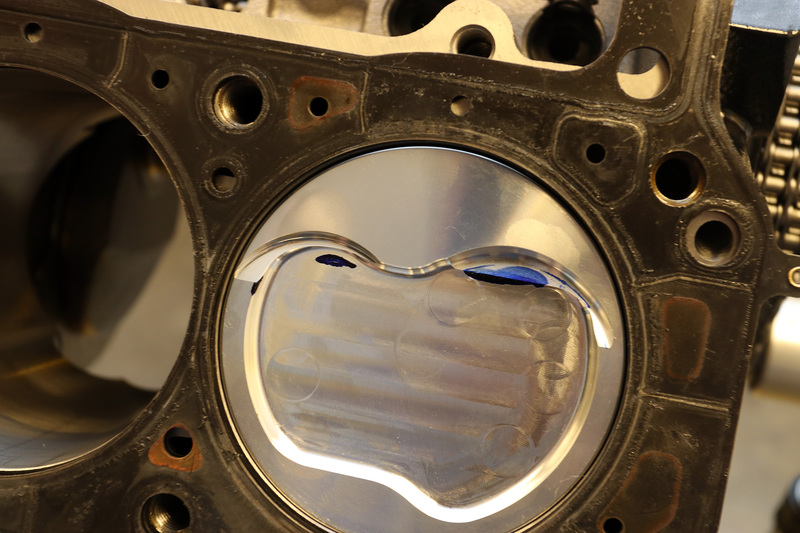 On this piston we will need to redo the exhaust valve because we didn't get a clear impression of the edge of the valve on the piston, but if you look closely you can see the arc of the intake valve on the bottom of the valve pocket-a perfect fit.